Commando comics have been on sale since 1961. 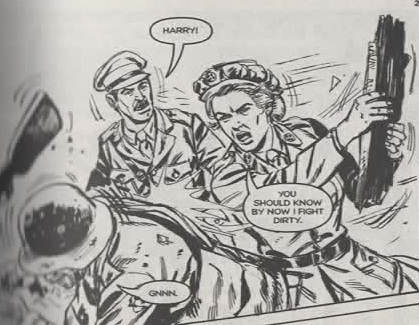 For those who don’t know them – they have a small, square format, containing 64 pages of black-and-white drawings telling a war story, most often about the Second World War. They are published by D.C. Thompson of Dundee, publishers of the once-mighty Beano. The Beano is not what it was. Is Commando? I was in W.H. Smith’s the other day, and noticed the above cover. 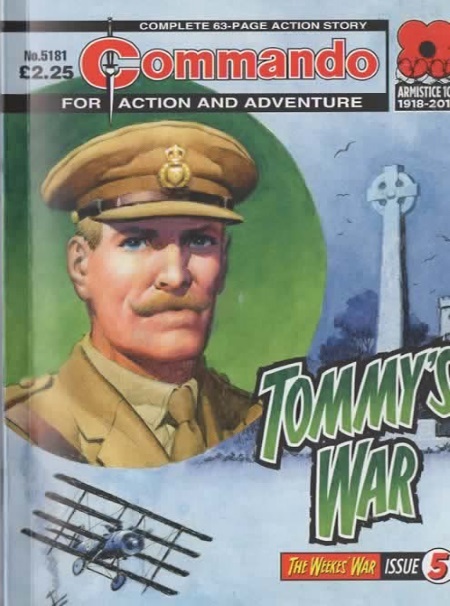 It turns out that recently Commando has been doing a series to mark the centenary of the Great War’s ending. Out of curiosity, I bought the magazine – number 5181 of a run of issues that has kept going for fifty-seven years (with the same personnel at the helm for most of that time). It turns out that this is the last of a WW1 series about the Weekes family, who play varied parts in the war. Dad is a medic, Tommy and daniel are soldiers, Michael flies a biplane, Harriet drives an ambulance and Billy is in the navy. Mother is at home, worrying about them and praying. Each of the five has a comic in the series devoted to them, and this one is Tommy’s story, though he plays a somewhat passive role in it. We see British soldiers (and German prisoners) on a still smoking battlefield, burying the dead. Dad and Tommy are missing, after a late German attack that included bombing a hospital. Assuming they have been taken prisoner, Harriet starts to drive her ambulance across no-mans-land to find them. Daniel insists on coming too. As they are driving, a German sniper starts shooting at them, even though the war is officially over. Harriet, as this frame shows, deals with him pretty efficiently. Commando has moved with the times in this respect, anyway. In line with twenty-first century thinking, girls are now allowed to be tough guys. In another respect, though, Commando is still exactly what it always was. When Daniel and Harriet find their father and Tommy in a German prisoner of war camp, they are horrified to find that the evil camp commandant has not told the prisoners that the war is over, and is still mistreating them. He is doing this, we gather, out of sheer Hunnishness. After all the pieties of other markers of Remembrancetide, I actually find it rather bracing to come across this bit of unreconstruced British anti-German feeling, unaffected by the passing of the years or the changes in respectable fashion. Commando knows what it is doing. It has flourished for half a century by sticking to its formula of decent Brits versus Hunnish Huns, and it’s not going to stop now. 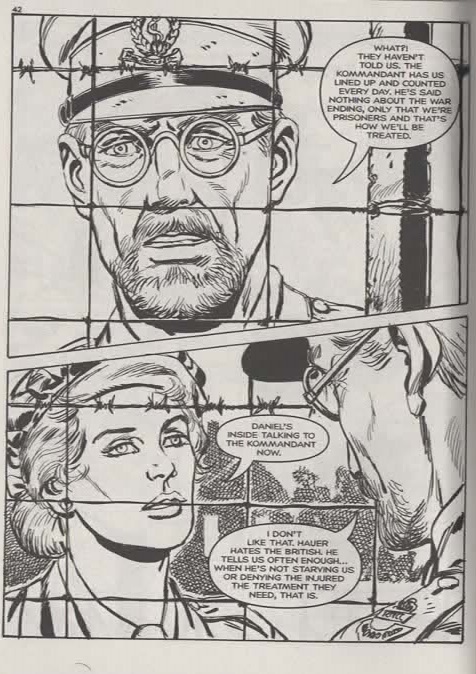 The last pages of the comic are a solemn reminder of the dead (Tommy didn’t make it back home.) But the tributes are to the courage and sacrifice of the British soldiers, with no suggestion that anone on the other side could be equally brave and decent. I’d actually say that there was more moral ambiguity in some boys’ comics of 1914-1918 than there is in this twenty-first century one. Sometimes historians and literary critics are tempted to think that in the popular mind there is now only one interpretation of the Great War – the Morpurgo-style Futility myth. Commando No. 5181 shows that this isn’t necessarily so. In this little corner of popular culture at least, an older, simplistically patriotic interpretation still holds sway. This entry was written by George Simmers and posted on December 14, 2018 at 10:39 pm and filed under novels with tags comics, Commando, D.C. Thompson, Huns, popular culture, war comics. Bookmark the permalink. Follow any comments here with the RSS feed for this post. Post a comment or leave a trackback: Trackback URL. That’s a most interesting start to the morning, George. I still have a dozen or so of the comparable Western Picture Library [’64 picture-packed pages’] from the 1950s, starring Buck Jones and Davy Crockett and Kit Carson, but I haven’t seen inside a war comic for fifty-plus years. Your point about the comic’s simplistic patriotism is very thought-provoking in this week of flailing foreign policy. I am a subscriber of this comics for more than 5 years. I live in Brazil but as an amateur historian I like to read about these histories, specially about the Great War. I agree that the caracters could be more elaborated and I recognize that the editor´s team is looking for this. And there are so many “new” wars to deal with that WWII could be resting for a time. Anyway I will keep my subscription for the years coming no doubts. Good lord, in the 1970s I used to pool my pocketmoney with my brother to buy Commando comics at the newstand at Aberdeen train station. They were definitely compelling reading.